Competing visions of the American West were on display at competing events in Whitefish Saturday. People rallied for their ideas about tribal sovereignty, public lands and constitutional rights. At the "Montana Undivided" rally In Depot Park, more than 300 people turned out to hear tribal members, clergy and a backcountry packer talk about historic and modern Native American presence in the area, and the cultural and economic value of Montana’s public lands. They chanted, "we love public lands!" at the rally, where Vernon Finley, former chairman of the Confederated Salish and Kootenai Tribal Council said he was glad to see so many people. Or, as he said in Salish and Kootenai, “share breath together” on the ashes and dirt made up of his ancestors. In the face of hate and open racism, he tells his friends what his grandmother told him about extreme points of view. "If you ever see one without seeing the other, it's because you're not looking," Finley said. "When you have one extreme, the other is also present. They're married. They depend upon one another." The rally was organized in response to a conference happening across town. About 100 were at that event, the “New Code Of The West" conference. Speakers there called for an end to tribal sovereignty and for transferring management of federal public lands to states. They lectured on theories that posit tribes, federal civil servants and the United Nations are working to strip away individual liberties and private property rights. Speaker Elaine Willman is the former national chair of Citizens Equal Rights Alliance, a group that seeks to change federal Indian policies that it considers threatening to non-tribal members’ rights. She now lives in Polson. She talked about what she calls the unconstitutionality of tribal sovereignty and federal American Indian policy. "It's just an indentured servant status for the American taxpayer, and we have no voice," Willman said. "Tribal members have no voice either." Speakers at both events urged attendees to vote in the upcoming midterm election for candidates who share their views. “New Code of the West" attracted a covey of current Montana state legislators and candidates, including Republicans Kerry White, Mark Noland, Joe Read, Jerry O’Neil, Dan Skattun and Lake County Commissioner Gale Decker. Republican statehouse members from Idaho and Washington came as well. 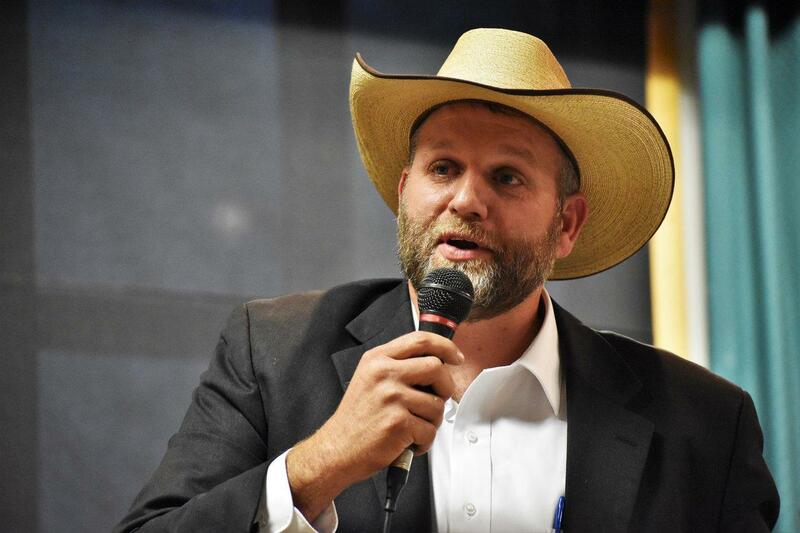 The event’s main draw was Ammon Bundy, whose armed occupation of a national wildlife refuge in Oregon in 2016 framed him as a leader in the movement to greatly reduce federal government power. Recently Bundy has been traveling western states spreading a contentious interpretation of the intentions of the framers of the U.S. Constitution. "They basically said unless you are using the land and the resources for military purposes, and other enumerated purposes, you don't have authority to own," Bundy said. Bundy said he’s often pegged as a radical for his views. But his push to transfer public lands to local authorities mirrors that of the Republican party. Both the Montana and national Republican party platforms support transferring public lands to the states. That backtrack may cost him votes in November. "That's one of the things that's turned me off with Matt Rosendale," said "New Code of the West" conference attendee Alan Wilson, who lives in Kila. "Somebody who's flip flopping on issues? That's never a good thing," Wilson said. Wilson says he’s considering voting for a third party candidate. Democrat incumbent Jon Tester opposes transferring federal lands and backs the Confederated Salish and Kootenai Tribal water compact, which Wilson says left Montanans out. Elaine Mitchell of Cut Bank also can’t quite get behind Rosendale. "I am disappointed out of the four Republican candidates that we had, I think we could have a better person representing us in D.C. than Matt," Mitchell said, "but I don't know him personally." I asked Mitchell would her ideal candidate and top three priorities would be. "The constitution, the constitution and the constitution," she replied. "All right? Like you haven't heard that enough today." She says she’s still deciding whether Rosendale, or any of the three Senate candidates, will win her vote. She didn’t say which candidate should have gotten the Republican nomination. None of the speakers at “New Code" conference or the "Montana Undivided" rally across town endorsed a candidate, but they did encourage attendees to vote. In closing out the “New Code" conference, an organizer encouraged attendees to share what they’d learned with their circle of influence.